Damion preparing surgical packs to be sterilized. 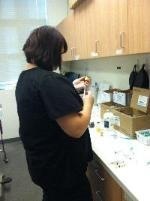 Allie preparing take home pain meds for the surgical patients. Spot getting ready to be spayed. The next step is to shave and scrub the surgical area while restraining the pet. Spot is under anesthia at this point. Now Spot has the monitoring machine hooked up as well as being intubated and on a mixture of oxygen and anesthesia. Spot is safe and comfortable and is being cafefully monitored by the veterinarian and a technician. Now Spot has had the surgical site carfully scrubbed and is covered by a sterile drape and is ready to be spayed.